You can tell a game is amazing when you have a hard time putting it down, continually making excuses for “just one more round,” or sitting down to play a match or two and suddenly it’s midnight. Dead Cells is the first game in a long time that had me staying up well past my bedtime constantly looking at the clock attempting to justify those extra 30 minutes of playtime instead of going to sleep. 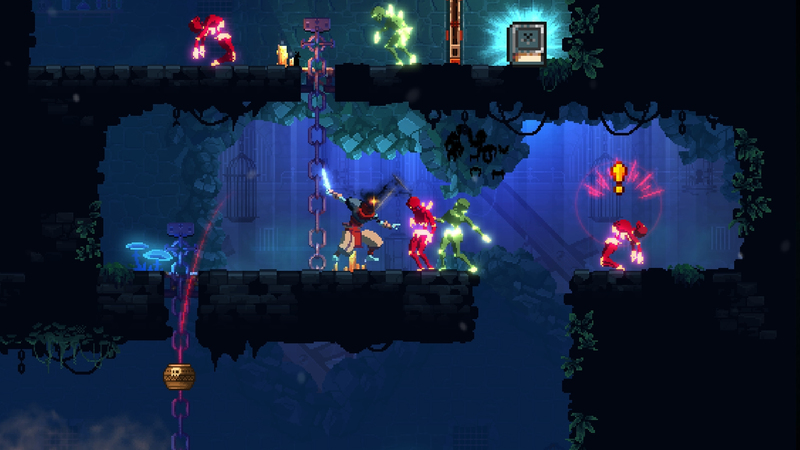 Dead Cells is a 2D side-scrolling action game developed by French developer Motion Twin. Marketing itself as a “Roguevania,” it combines exploration and platforming from the Metroidvania genre with Rogue-like elements such as permadeath and procedural generation. There isn’t much in the way of story. 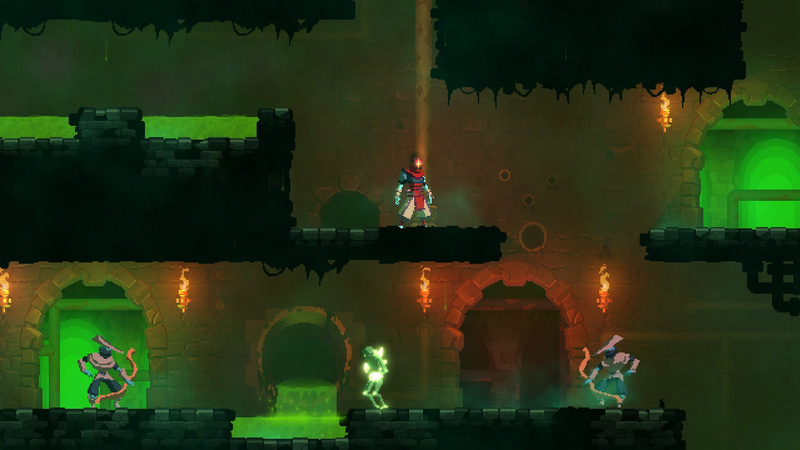 You play as a headless body that has been reanimated by some sort of sentient green mold. Your character is informed by a knight that you have been doing this for eternity; constantly rising from the dead to slay monsters only to die and show up back in the executioner’s chamber. Afterward you are given a weapon and are sent off to see how far you can get. The game has you slashing your way through countless enemies across a variety of environments, all while collecting gold, blueprints and “cells” all of which can be exchanged for new weapons, abilities and upgrades that persist after death. Gold is used to buy weapons from shops found throughout the world, or to pay tributes at special doors. 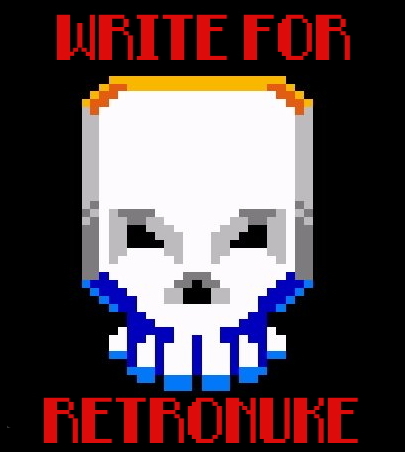 Blueprints are dropped by enemies and will grant the player access to additional abilities and weapons such as rapiers, dual daggers, spears, bows and bombs. Cells are used to unlock and upgrade said blueprints, but only if you can make it to the end of a level. Upon death, you will lose anything you are carrying and spawn back in the aforementioned executioner’s chamber. The game promotes exploration with secrets to find and runes to collect. Secrets vary between gold, health and blueprints. Runes are gained from defeating elite enemies which can be found throughout the world. Runes permanently unlock access to areas that were previously unreachable to the player. My favorite aspect of this game is the art style. Motion Twin absolutely kills it with Dead Cell’s presentation and visuals. The world has a dark and gloomy feel to but at the same time, has these vibrant and saturated colors. Every environment has its own color theme. The Promenade of the Condemned has a woodland feeling to it with a cool blue-green color pallet. The Ossuary has piles of burning bodies and gore hanging from hooks that’s complimented by a red, purple and pink pallet. The Graveyard, which is probably my favorite level, has this 80’s horror theme of pink and blue. Monsters are also visually appealing. Every level has a few enemies that are unique to that area, whether it be giant, sword-wielding skeletons or slugs that drop explosive eggs when killed, or teleporting zombies, every monster has this extra little bit of personality that makes them all feel pretty unique. For an Early-Access title, Dead Cells has some of the best combat I’ve experienced in a 2D action game. Tight controls are partly responsible for this but I have to give credit to the weapons themselves. Rapiers will inflict critical damage after a dodge roll, Assassins blade will crit if struck from behind. Frantic blades do more damage when you are below 50 percent health. Every weapon has its own unique ability that suit a variety of play styles. In addition, some weapons and abilities also come with special effects and modifiers: Certain items can cause minions to spawn from slain monsters, others will poison enemies when damaged and others will fire grenades or arrows when used. All of these combine to create a combat system that is extremely satisfying, and will often times trick the player, or at least myself, into a false sense of security before murdering them unexpectedly while on a killing spree. This leads to some of the issues I have with Dead Cells. The game is great, but it isn’t perfect. Most of my problems are deeply seated within a lot of these Rogue-like titles: RNG. Random number generators are what a lot of Rogue-like titles rely on to keep gameplay fresh, but that also means that you are at the mercy of whatever the game decides to give you. If you like daggers, but the game gives you swords and spears with horrible rolls, tough luck. Another complaint comes from the scaling of enemy damage. For instance, the green zombie. A monster found in the early levels but persists into the later ones as well. If they hit you with their jump attack it does a decent amount of damage in the first area, but nothing to serious. However once you travel to another area like the Ossuary, that same green zombie will one shot your character if you don’t have any health upgrades. Outside of these issues, the rest are just minor frustrations with the games mechanics. For example, a swinging mace over a pit of spikes serves as an environmental hazard. If you are hit while going in the direction the mace is spinning you will be locked in a stagger animation and receive numerous hits until the mace decides to just let you go. There isn’t much the player can do once they are struck and it just results in having to chug a health potion. For all its faults, I have a hard time staying angry when I play Dead Cells. The vibrant colors and tight combat are an absolute joy to experience. Every time I start a new playthrough I find myself excited and constantly exploring the same areas hoping to find a new item that will allow me to progress further than the last time. Even despite the game waiting for me to get a little cocky and drop my guard before brutally murdering me, my salt never lingers for very long. Dead Cells is available on Steam for $16.99. If you have 20 dollars to spare, I highly recommend picking this one up. Motion Twin deserves your money so they can continue to create other little gems like this.